As 5th grade approaches we will be moving away from spelling features (spelling words) and focus on word study with Greek and Latin roots. Students will bring home their new flash cards Thursdays or Mondays ( If we forget Thursday!). We will still work on spelling features in our small groups, but test on the Greek and Latin stems, on Thursday. This grade will be reflected in the spelling section on the report card. 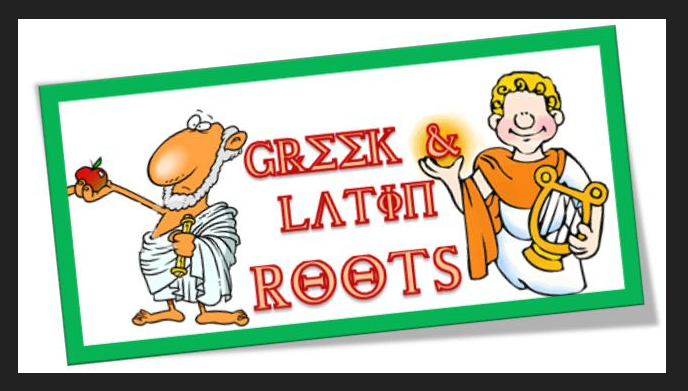 Why should you be teaching Greek and Latin roots to your students? 1. Consistency: Not only do these roots follow fairly consistent orthographic patterns, they also have distinct semantic(relating to meaning in language or logic) components; these features, when explicitly taught, allow students to link pronunciation, spelling, and meaning when encountering new and/or challenging words. Just as primary teachers utilize the consistency of word families to teach their emergent readers, upper grade and secondary teachers can also rely on the consistency of roots when teaching their students. 2. Increased Demands: Each year students in grades 5 and higher encounter around 10,000 new words in their reading! Most of these new words will be of Greek and Latin origin. When students are familiar with highly utilized roots, learning such a vast number of new words becomes so much more manageable. 4. Technical Vocabulary: Content areas such as science and social studies overwhelm students with unfamiliar vocabulary. Fortunately, most of these scientific or scholarly terms are grounded in Greek and Latin origins. If students know the meaning of a root, they are more apt to determine the meaning of an unknown word that uses that root.